So far the ride wasn’t very good but the animatronics were amazing! In the cover story the Doctor ends up on the planet Zom, where beings called the Brains Trust (who have giant brains for heads) have stripped the world of emotion, or at least are trying to. A resistance movement is trying to rise up against them and the Doctor soon finds himself part of that group. (This was after all the most emotional of the Doctors thus far.) Each member of the group practices one emotion exclusively (you know, like Smurfs), and one faction, led by “Big Hate” is willing to kill everyone with his little monsters when the Brains Trust’s forces arrive to kill the Doctor. What they got right: It was more interesting than Elysium anyway, probably because of the Doctor. Frankly a story involving the stripping of emotions isn’t an easy one to pull off. It’s doing okay so far. What they got wrong: This is a problem in the back-up as well, but not as often. The text seems to be written all in bold and sometimes the letters are hard to make out. The Brains Trust design is kind of silly but you can make the case it’s in line with the show given the budget at the times and the things Douglas Adams (one of the script editors during Tom Baker’s run as the Fourth Doctor, because there were no showrunners at the time like New Who) would come up with, so I guess it works. In the backup story Jack Russel doesn’t make it home in time thanks to a traffic accident and has to run into the woods to avoid hurting anyone as the werewolf. There he comes across a pack of wolves who escaped one of the trucks involved in the accident, who works for a testing lab and the lead wolf has rabies. The Werewolf kills the rabid wolf but before he can claim the others as his pack they’re captured. I think this the Werewolf’s deal, accidentally saving others (like a couple of women the wolves were about to attack or stopping the rabid wolf). 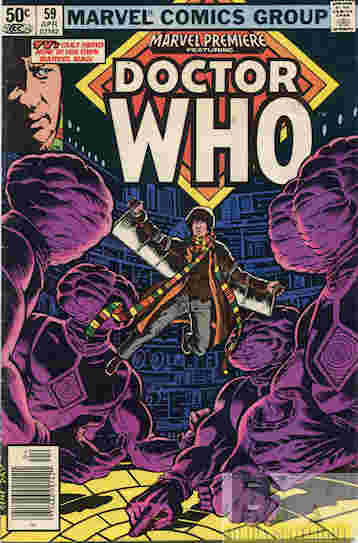 While I kind of wish this had been another Doctor Who side character story like last issue and we would see in the Doctor Who ongoing, it’s not a bad short story. Recommendation: An interesting main story and decent backup. Might be worth checking out if the ending of the Doctor’s tale isn’t complete rubbish. We’ll find out next time. Posted by ShadowWing Tronix on July 25, 2018 in Marvel Spotlight, Television Spotlight, Yesterday's Comics and tagged Doctor Who, Jack Russell, The Fourth Doctor, Werewolf By Night.